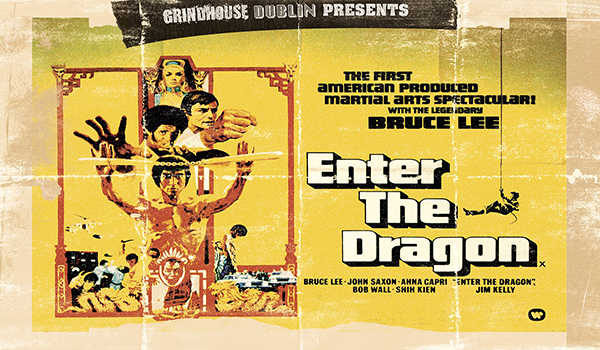 Grindhouse Dublin, in association with Light House Cinema, are thrilled to announce this months action packed screening, the martial arts masterpiece ‘Enter The Dragon’! Not much more can be added to what has already been said about Enter The Dragon. It single handedly put Kung Fu films on the map and made an international superstar out of Bruce Lee, becoming one of the most popular material arts films ever made. Originally hacked and slashed by 1 minute for its UK and Irish release, for use of “offensive weapons” (most notably the use of nunchakus) we will be screening the film fully uncut. See the deadly three (Roper, Williams and Lee) on big screen, the way they were meant to be seen! Lee (Bruce Lee), a member of the Shaolin Temple is asked by British secret service to infiltrate the island of Han (Shih Kien), a renegade Shaolin monk, now peddling an Opium operation and slavery trade. Lee soon learns that Han's men tried to abduct his sister, which resulted in her suicide. Now with the added personal vendetta, Lee must travel to Han’s island along with Vet buddies Roper (John Saxon) and Williams (Jim Kelly), both with their own set of problems. Now it’s up to Lee to get them out alive. All that stands against him is an invincible army! Enter The Dragon will be shown at Light House Cinema, Smithfield on Friday 30th June at 10:30pm!